Well… just when everyone thought this team would get another run after their regular season, things would be different after tonight. 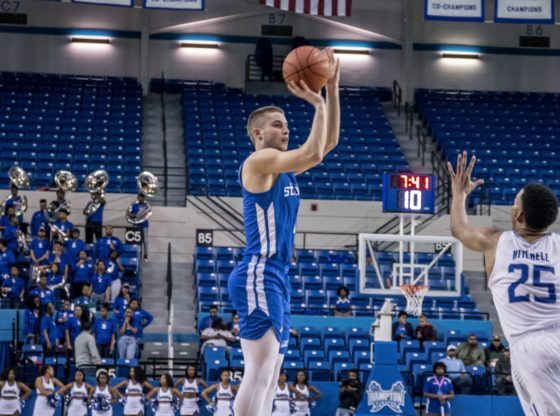 The St. Francis Terriers (17-16) suffered a 72-81 first round loss in the CIT to the Hampton Pirates (16-16) on Thursday night at Hampton University Convocation Center. Pirates forward Trevond Barnes had a field day against the Terriers, scoring his career high 22 points on 6 of 8 shooting while making both of his 3 point attempts. Lysander Bacey would also chip in with 17 points off the bench on 4-8 shooting. Terriers guard Stevan Krtinic had one of his better games in his season finale scoring 19 points on 7 of 9 shooting from the field while also shooting 5-6 from beyond the arc. Rozel Hurley would add in 18 points and Deniz Celen would score 11 points. Terriers Jalen Jordan, leading scorer in 3 point percentage and attempts made would only put up 7 points in going 1-2 from beyond the arc while going 2-5 from the field. Glenn Sanabria, the Terriers’ center piece in serving as floor general for the offense, was missing in action in coming up short with just 5 points on 2-11 shooting. The Terriers wrap up their 2018-2019 season finishing (17-16, NEC 9-9). Better Luck to these Terriers for next season.